The Component Source Information window allows you to add or modify any ingredient sources you may utilize throughout the manufacturing process. By default, you will be presented with the option to add a new source or access the drop-down menu to view or edit existing sources. 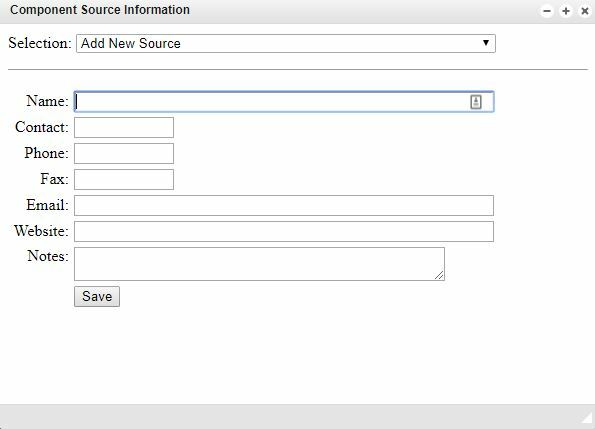 If you are creating a new source, complete the required, empty fields and click save. From the sources window, you will find several fields related to your chosen source selection from the drop-down including their name, contact, phone number, fax number, email address, website and any notes you may have included. If any of this information needs to be changed, simply modify the chosen fields and click save. Once the save button is clicked, your source information will be updated.